The North Carolina Department of Environmental Quality is releasing a statewide inventory of greenhouse gas (GHG) emissions for public review. The GHG Inventory contains a detailed accounting of anthropogenic GHGs emitted or removed by key source categories from 1990 to 2017. 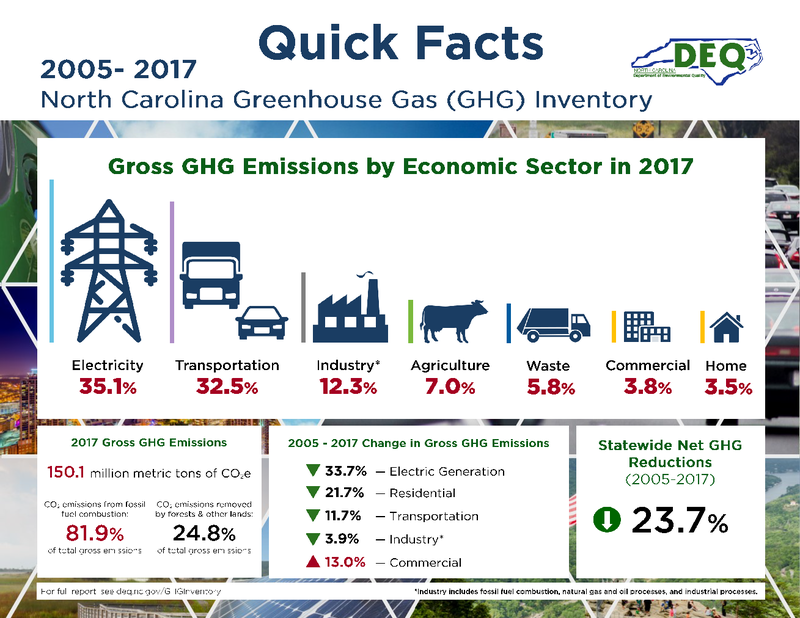 The inventory also projects North Carolina’s GHG emissions from 2018 to 2030 based on forecasted changes in fuel use, land use, population, historical trends, and other factors. The North Carolina GHG inventory estimates emissions of the six primary anthropogenic GHG pollutants listed below. The inventory, along with documentation of the data and methods used to develop the emissions estimates, was provided to stakeholders for review between November 2nd and December 14th of 2018. Stakeholders were asked to suggest or provide more appropriate data sets or methods that may improve North Carolina’s estimates. Summarized comments and responses from the public comment period are listed in Appendix D of the report. The GHG inventory is expected to be updated biennially to incorporate advancements in data and methodologies, as appropriate.